Summer = beach time. With so many choices, check out these tips to decide which one you'll visit next. With more than 3,100 miles of shoreline, Maryland has plenty of great places to sink your toes into the sand. From the ocean beaches of Ocean City and Assateague on the Atlantic Coast, to the shores of the Chesapeake and her tributaries, to spring-fed swimming holes and mountain lakes, Maryland’s got sun, surf and plenty of sand just waiting for you! Explore more top things to do in the summer in Maryland. Lay of the land (or sand): A week in Ocean City is a longtime summer tradition. The first resort hotel opened here in 1875, and the beach-goers have been arriving ever since, by train, ferry, or just by driving across the Chesapeake Bay Bridge. For a lot of Marylanders, summer means going “downy ocean, hon.” Highlights: Amusement park rides at Trimper’s, spending a handful of quarters (or more) at Marty’s Playland and a huge helping of Thrasher’s fries are the essence of summer (oh, and a couple dozen steamed crabs for dinner). Things to do: The beauty of O.C. is doing whatever you want. Lie on the beach and read a book, go to a movie, hit the Ocean Bowl Skate Park or play a round of mini-golf. Looking to leave civilization behind? An undeveloped strip of land crisscrossed by wildlife trails, Assateague makes a great getaway. Highlights: It’s the ideal spot for beach camping, made extraordinary by the presence of the famous wild horses that roam the park. Home to bald eagles, island foxes, dolphins, whales, and of course the beautiful horses, it’s no wonder National Geographic Traveler named it one of the 10 best U.S. state parks. Highlights: This state park offers stunning bay views, as well as swimming, fishing and hiking. Things to do: Sandy Point is home to Chesapeake Region Accessible Boating (CRAB, naturally), an organization that works to make boating accessible to disabled people, and all the facilities in the park are accessible. It’s also home to the Maryland Seafood Festival in September. Sandy Point’s location on the Atlantic Flyway makes it an ideal spot for bird watchers and wildlife seekers, just minutes from downtown Annapolis. Highlights: These twin beaches are connected by a summer shuttle, and they’re just an hour away from Washington, D.C., making them an easy weekend trip for city folk. There’s plenty to do, and the Chesapeake Beach Resort & Spa offers upscale digs if you’re looking to get away from it all. The Hammerman area of this large state park has a popular beach and swimming area—get there early to make sure you get a great spot. Amenities: There’s a concession stand, small boat launch and a place to rent kayaks and paddleboards, too. Things to do: Look across the broad Gunpowder River toward the south where it empties into the Chesapeake Bay, or take refuge from the sun under one of the trees just a few yards from the sand.Top tip: There are many areas of this state park—call ahead for directions to the Hammerman area to ensure you discover this great beach. With 69 miles of shoreline, Deep Creek is the state’s largest man-made lake, with a swimming beach and boat rentals plus a host of events and nearby restaurants.Things to do: For a dose of exhilaration, head to Adventure Sports Center International where manmade white-water courses offer a perfect place for new paddlers to get their feet wet—literally—or to challenge the most advanced pro. In the Catoctin Mountains near Thurmont, the Maryland Department of Natural Resources has set aside three designated swimming areas in Hunting Creek Lake. 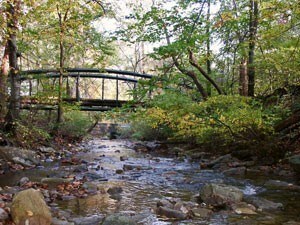 Each summer, visitors flock to the waterside for picnics or to camp out overnight. Top tip: Be sure to stop by the 78-foot waterfall for which the park is named; it’s spectacular—and the state’s largest. This is a grand, natural bay beach for swimming, hiking and just being in the great outdoors. The big draw, though, is fossil collecting along the sandy quarter-mile stretch of beach. More than 600 species of fossils including massive megalodon shark teeth dating back 10 to 20 million years have been found along the shore, so it’s the perfect place to take shark-obsessed youngsters and budding fossil-hunters. Highlights: A half-mile of sandy beach, a netted swimming area, and a 200-foot pier for crabbing and fishing make Breezy Point an ideal getaway spot in Calvert County. Top tip: Families will love to stay at the attached campground and search the beach for prehistoric sharks’ teeth. Bayfront enjoyment: This park fills up on summer days with families looking to escape to bayfront relaxation. Things to do: If you’re looking for a different kind of sand, Rocky Point Golf Course is the only waterfront golf course on the western side of the Chesapeake. A short boat trip off the point, Hawk Cove and Pleasure Island at Hart-Miller Island State Park offer beach camping for those who want to get a little off the beaten path. 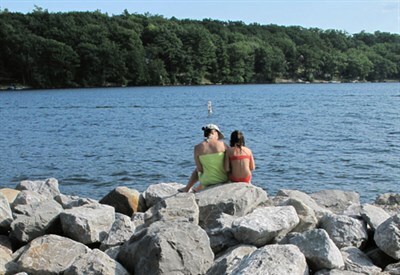 Your go-to lake beach in Western Maryland: Rocky Gap offers the best of lakefront living, with public beaches, bike and hike trails, championship golfing, and fishing and boating. Things to do: Climb to the top of Evitts Mountain for spectacular views, then hike back to Lake Habeeb to cool down and camp out. For indoor fun, Rocky Gap also has a resort and casino on the lake. For people and dogs alike: Just across the Chesapeake Bay Bridge on the Eastern Shore, Matapeake provides beautiful views, trails and a public beach (including a separate dog beach). Places to visit while there: Matapeake Beach & Club House, a restored 1930s ferry terminal, is a popular wedding spot; coupled with the nearby Stevensville Crab Shack, you’ve pretty much got your vacation needs covered. This picturesque peninsula formed by the Chesapeake Bay and Potomac River belie its past -- it was once the site of a Confederate prison camp during the Civil War. A museum, monuments and mysterious hauntings recall its notorious past. Mountain melodies, jazz, funk, metal and more fill Maryland’s Summer of Music. A look at Maryland’s miles of waterfront, from well-known resorts to quiet coves.